Product information "Haibike SDURO Hardseven Life 2.5 Street blue/white matte 2019"
The SDURO Hardseven Life is equipped with 27.5 inch wheels. These guarantee very agile and agile handling in easy terrain and on trails. 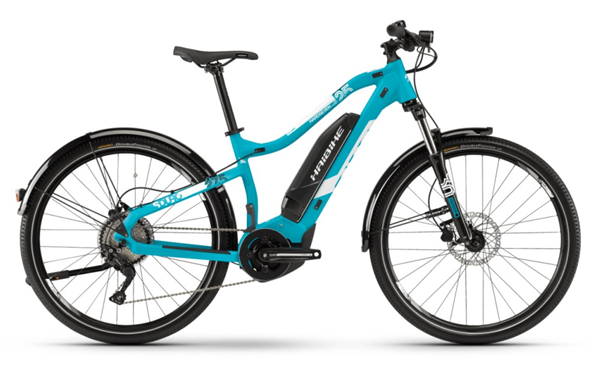 The 100mm suspension fork and the 180mm disc brake provide the necessary security. The Life models are specially tailored to the needs of women. In other words, the Life models have custom geometry, a special saddle and special grips. In addition, the frames are also made in small sizes. Due to the 10-speed gear you always have the right gear for every terrain. So you're not too steep! This is also ensured by the powerful Yamaha PW-SE engine with 250W. The 400Wh battery ensures that you can handle long trips without any problems. In addition, the E-MTB is equipped with mudguards. Fork SR Suntour XCM ATB, steel spring, travel: 100mm, steel shaft 1 1/8 "
Related links to "Haibike SDURO Hardseven Life 2.5 Street blue/white matte 2019"
Customer evaluation for "Haibike SDURO Hardseven Life 2.5 Street blue/white matte 2019"